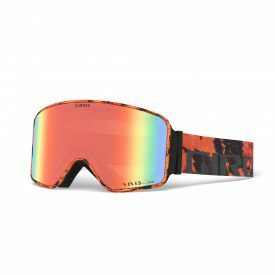 (January 29, 2019 – Park City, Utah) Giro Sport Design, the leader in high-performance snow helmets and goggles, today announced the launch of the new Method™ goggle. It features a wide field of view, crisp visibility and a premium VIVID lens with Optics by ZEISS®. Method™ goggles at $130 / £135 / €150 and will be available starting Fall 2019 from authorized Giro retailers and www.giro.com. While the new Giro Method™ goggle takes a page from the past, with bold retro styling and design elements inspired by timeless sunglass silhouettes, its advanced technology make it definitively modern. Giro’s product developers designed Method™ to sit as close to the face as possible, expanding the rider’s field of view and making it easier to spot and stick landings. EVAK Vent Technology prevents fogging during high intensity efforts and a triple layer face foam with microfleece facing provides all day comfort. Also noteworthy is the totally new vent design that not only creates a unique textured aesthetic, but also offers durability and structure. The goggles come with two, injection-molded cylindrical VIVID lenses with Optics by ZEISS® that can be quickly changed using the Slash Seal lens interchange system. Additionally, Method™ goggles are Adapt Strap-compatible, so riders can personalize their goggle more than ever before. Offered in 11 different frame/strap designs, with up to 14 standard lens configurations. This is a new frame design from Giro that optimizes a massive spherical lens to provide maximum peripheral vision and an unparalleled field of view. This ultra-durable, non-absorbent foam material minimizes fogging by releasing moisture while simultaneously creating a barrier from the elements. Exclusive on all Giro goggles. This technology helps refine optics and minimize distortion that can occur in thermal-formed cylindrical lenses. Protected by durable, scratch-resistant coating. An easy and intuitive interface for swapping out lenses on-the-go.